All too often parents may neglect to bring their children to the dentist for preventative care for their primary teeth. Regular teeth cleaning and checkups are important for every member of the family including young children because the child’s developing mouth and teeth should be monitored to make sure that there are no problems that need correcting either in the formation of the jaw or in the development of the teeth. In addition The Nevins children’s dentistry practice of Londonderry Family Dentistry can also detect any instances of decay invading a tooth and correct the problem before it becomes a more serious issue. Children should also be made aware at the earliest possible age of the importance of good dental hygiene habits and begin to practice them. It is important that the young child enthusiastically cooperate in his/her own good dental health. The Nevins children’s dentistry practice teaches them to become an active participant by instructing them in the proper methods of brushing and flossing. 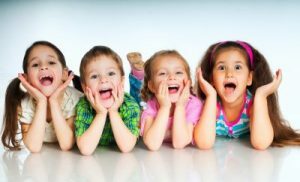 Our doctor and entire staff go out of their way to make each of your child’s visits a fun and pleasant experience so that they want to come back and don’t develop any fear of going to the dentist. A big part of our pediatric dental service is prevention, aside from teaching children to brush their own teeth our practice emphases regular teeth cleaning to rid the teeth of any plaque or tartar buildup to prevent the start of decay and cavities. Teeth cleaning are only part of our pediatric preventative program. The Nevins children’s dentistry practice recommends the application of sealants on young teeth. Sealants are thin plastic coatings that are painted in the chewing surfaces of the back teeth, molars and premolars. These sealants bond into the grooves and depressions on the chewing surfaces to help prevent decay. Our doctor also recommends fluoride treatments, which strengthen the enamel of the child’s teeth to help resist decay. Don’t wait until your child’s permanent teeth start to erupt bring them into our office much earlier so that we can begin to make sure that they enjoy great oral health.